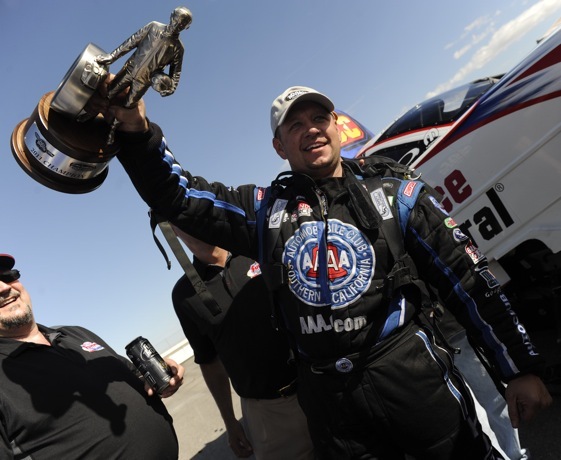 Robert Hight set the national NHRA Funny Car speed record at the Ford NHRA Thunder Valley Nationals presented by Tri-Cities Area Ford Dealers and won his fourth race of the season in doing so. Larry Dixon (Top Fuel) and Mike Edwards (Pro Stock) also were winners at Bristol Dragway in the NHRA Full Throttle Drag Racing Series. Hight finished off the rain-plagued final day be beating Jack Beckman in the finals. Hight powered to a 4.092-second run at 314.90 mph while Beckman trailed with a 5.615 at 152.66 in his Aaron’s/Valvoline Dodge Charger. Hight’s final-round speed certified his earlier performance of 316.45 as the national record. Hight defeated Ron Capps, teammate and series leader Mike Neff and Jeff Arend en route to the final round. Despite his second-round exit, Neff maintained his series lead, with runner-up Beckman moving to second and Hight remaining in third. In Top Fuel, Dixon claimed his first win of the season and his sixth Father’s Day victory by outrunning Antron Brown in the final round. Dixon took his 61st victory and second at Bristol Dragway with a 3.836 at 318.09 in his Al-Anabi Racing dragster to finish just in front of the hard-charging Brown, who posted a 3.851 at 306.19 in his Matco Tools dragster. With the win, defending world champ Dixon moved into second place in the standings, 31 points behind series leader Del Worsham, Dixon’s teammate who lost in the quarterfinals to Massey. Edwards claimed his third consecutive Bristol Dragway win and 30th of his career and in the process denied Erica Enders a milestone victory as she tried to become the first woman to win in the history of the 41-year-old factory hot rod category. Enders left the starting line first in her ZaZa Energy Chevy Cobalt, but the car lost power near midtrack while Edwards sped down the track to finish in 6.685 at 205.79 in his Penhall/Interstate Batteries Pontiac GXP. Edwards moved to second in the series standings with the victory and trails Jason Line by 24 points. The NHRA Full Throttle Drag Racing Series continues June 23-26 with the fifth annual Summit Racing Equipment NHRA Nationals at Summit Racing Equipment Motorsports Park in Norwalk, Ohio. Final finish order (1-16) for professional categories at the 11th annual Ford NHRA Thunder Valley Nationals presented by Tri-Cities Area Ford Dealers at Bristol Dragway. The race is the ninth of 22 events in the NHRA Full Throttle Drag Racing Series. 1. Larry Dixon; 2. Antron Brown; 3. Spencer Massey; 4. Tony Schumacher; 5. Del Worsham; 6. Brandon Bernstein; 7. Morgan Lucas; 8. Chris Karamesines; 9. Shawn Langdon; 10. Austin Lambright; 11. Doug Kalitta; 12. David Grubnic; 13. Bob Vandergriff; 14. Rod Fuller; 15. Terry McMillen; 16. Pat Dakin. 1. Robert Hight; 2. Jack Beckman; 3. Jeff Arend; 4. Cruz Pedregon; 5. Mike Neff; 6. Melanie Troxel; 7. Bob Tasca III; 8. Matt Hagan; 9. Jim Head; 10. Johnny Gray; 11. John Force; 12. Tim Wilkerson; 13. Tony Pedregon; 14. Ron Capps; 15. Paul Lee; 16. Daniel Wilkerson. 1. Mike Edwards; 2. Erica Enders; 3. Allen Johnson; 4. Greg Anderson; 5. Ron Krisher; 6. Jason Line; 7. Vincent Nobile; 8. Rodger Brogdon; 9. Ronnie Humphrey; 10. Shane Gray; 11. V. Gaines; 12. Greg Stanfield; 13. Richard Freeman; 14. Larry Morgan; 15. Warren Johnson; 16. Steve Kent. Top Fuel — Larry Dixon, 3.836 seconds, 318.09 mph def. Antron Brown, 3.851 seconds, 306.19 mph. Funny Car — Robert Hight, Ford Mustang, 4.092, 314.90 def. Jack Beckman, Dodge Charger, 5.615, 152.66. Pro Stock — Mike Edwards, Pontiac GXP, 6.685, 205.79 def. Erica Enders, Chevy Cobalt, 11.863, 72.89. Pro Modified — Melanie Troxel, Chevy Corvette, 5.928, 250.83 def. Danny Rowe, Chevy Camaro, foul. Super Stock — Mike Saye, Pontiac Firebird, 10.559, 115.00 def. Dan Fletcher, Chevy Camaro, foul. Stock Eliminator — Dan Fletcher, Chevy Camaro, 11.648, 101.07 def. Joe Santangelo, Camaro, 11.149, 98.93. Super Comp — Shane Carr, Dragster, 8.946, 160.08 def. Riley Ledbetter, Dragster, 8.936, 172.96. Super Gas — Tommy Phillips, Chevy Corvette, 9.968, 134.83 def. Scott Lawton, Chevy Roadster, broke. Top Dragster — Jenifer White, Dragster, 6.632, 203.61 def. Casey Spradlin, Dragster, foul. Nitro Harley — Tommy Grimes, Harley, 6.328, 224.32 def. Damian Cownden, Harley, 12.222, 71.11. FINAL — Dixon, 3.836, 318.09 def. Brown, 3.851, 306.19. FINAL — Hight, 4.092, 314.90 def. Beckman, 5.615, 152.66. FINAL — Edwards, 6.685, 205.79 def. Enders, 11.863, 72.89. 1. Del Worsham, 763; 2. Larry Dixon, 732; 3. Spencer Massey, 729; 4. Antron Brown, 679; 5. Tony Schumacher, 670; 6. Doug Kalitta, 503; 7. Brandon Bernstein, 458; 8. Morgan Lucas, 426; 9. Shawn Langdon, 396; 10. Terry McMillen, 364. 1. Mike Neff, 765; 2. Jack Beckman, 705; 3. Robert Hight, 691; 4. Cruz Pedregon, 635; 5. Matt Hagan, 544; 6. Jeff Arend, 488; 7. Bob Tasca III, 462; 8. John Force, 451; 9. Ron Capps, 440; 10. Johnny Gray, 431. 1. Jason Line, 694; 2. Mike Edwards, 670; 3. Greg Anderson, 645; 4. Greg Stanfield, 617; 5. Vincent Nobile, 598; 6. Rodger Brogdon, 571; 7. Allen Johnson, 557; 8. Erica Enders, 521; 9. Shane Gray, 437; 10. Ron Krisher, 414.